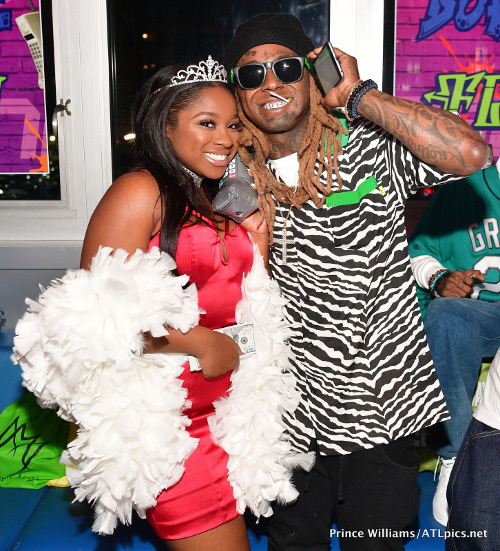 On November 29th, Reginae Carter turned 18-years-old and her parents Lil Wayne and Toya Wright threw her a 90s-themed party at the Suite Food Lounge in Atlanta, Georgia to celebrate the occasion. As well as Nae Nae, Weezy and Toya, other special guests that made an appearance at the birthday bash included Mack Maine, Tiny, Kandi Burruss, Bow Wow, Lil Chuckee, Gudda Gudda, Lloyd, Nivea, Sarah Vivan, Rasheeda Frost, Zonnque Pullins, Lil Twist, Shaniah Mauldin, Cortez Bryant, Petey Lo, and more. For Reginae‘s gift from her father Tunechi, he gave her $18,000 in cash as she turned 18. You can check out plenty more photos from the party after the jump below, courtesy of Prince Williams! In this post, you can watch Lil Chuckee‘s recent interview with Sway Calloway on his Shade 45 “Sway In The Morning” radio show. 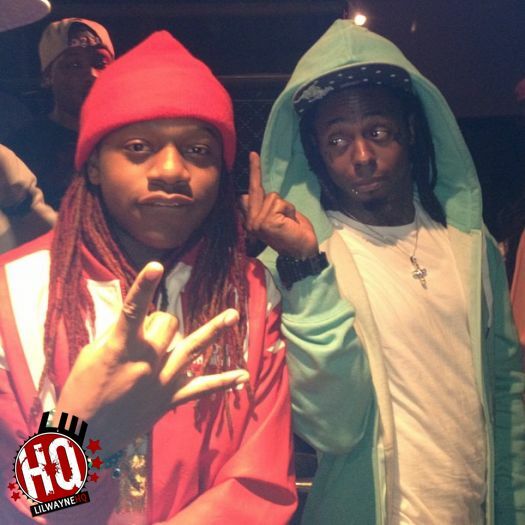 During the conversation, Chuckee chatted a little bit about Lil Wayne, why he is still the “big bro”, and how much he thinks Wayne has influenced the “new generation” of rappers. Lil Chuckee even went into detail and spoke about why he left Young Money, his relationship with artists on the label, not taking Birdman to court, his Overdue mixtape, and plenty more. The former YMCMB artist also shared his thoughts on Tyga wanting to leave the label and mentioned that YM may act like a family on camera, but behind the camera it’s all a business. You can watch Chuckee‘s full interview and freestyle with Sway in the video below! The wait is finally over! 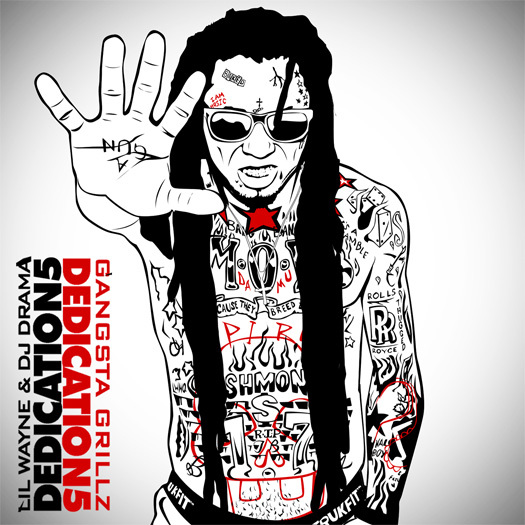 Lil Wayne releases the fifth installment of his Dedication mixtape series hosted by DJ Drama. 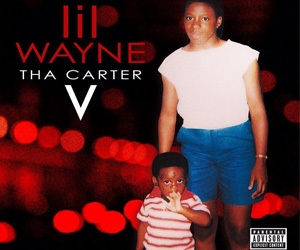 Weezy‘s D5 tape consists of 29 songs with features from 2 Chainz, Birdman, Future, Boo, Chance The Rapper, Gudda Gudda, Euro, Kidd Kidd, Jae Millz, The Weeknd, T@, Lil Chuckee, T.I., Vado, and Mack Maine. 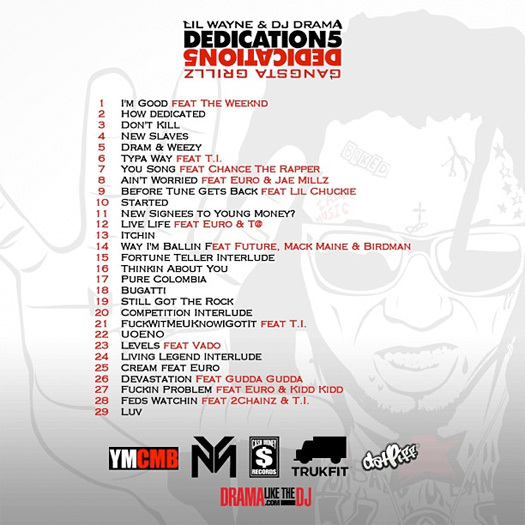 You can listen to Dedication 5, grab the download link, and view the back cover with the full tracklist on below! 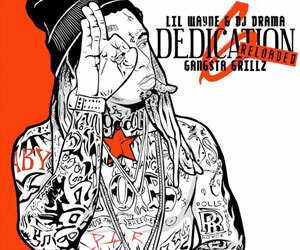 Lil Wayne has released the official tracklisting for his forthcoming mixtape, Dedication 5, which will be released at 5AM EST! The tape includes 29 tracks (including “Bugatti“) and features from 2 Chainz, Birdman, Boo, Chance The Rapper, Euro, Future, Gudda Gudda, Jae Millz, Kidd Kidd, Lil Chuckee, Mack Maine, The Weeknd, T@, T.I., and Vado. In the video above, you can watch some footage of Lil Wayne and Kendrick Lamar making an appearance at Bamboo nightclub in Miami, Florida for “Prestige Sundays” on May 5th. Other music artists who can also be seen at the club are Mack Maine, Lil Chuckee, Lil Scrappy, Boo, and Fuke. Click here to view photos from the night!